Review scores don't equal sales, says EA, as it goes on the defensive over Medal of Honor. 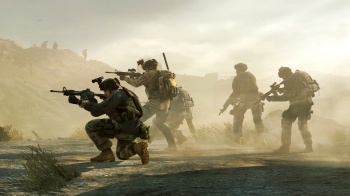 Despite mixed reviews for Medal of Honor, leading to a relatively low Metacritic score compared to the likes of Modern Warfare 2 or Battlefield: Bad Company 2, EA is still confident that the relaunch of the MoH series will be a success. An EA spokesperson said that critic's scores were very subjective and didn't translate directly to sales. Medal of Honor had received the most pre-orders of any game in the series, which was especially impressive as the series had been dormant for a while, the spokesperson added. According to EA, Medal of Honor is just the first step towards the publisher reclaiming a share of the first-person shooter market, a process it characterized as a marathon rather than a sprint. Just yesterday, analysts said that a Metacritic score less than 85 for Medal of Honor would be a "black eye" for EA. Aggregate scores of around 75 for the game would seem to have given EA that black eye, with a bloody nose thrown in for good measure as EA's stock dropped by 6%, although some believe that this is simply the end of a run for EA stock caused by the release of Medal of Honor, rather than anything to do with its reception. EA comments are clearly an attempt at damage reduction; no one says reviews are subjective when a game gets nines across the board. But it does have a point when it says reviews and sales aren't the same thing. Medal of Honor could still go on to be very successful, even if it hasn't been a massive hit with critics. Medal of Honor is available now in North America, tomorrow in Europe and Australia, and on Friday in the UK.